A transition housing and transform it into Interim/bridge housing from which homeless youth could transition to the best suited form of permanent housing, such as rapid re-housing or permanent supportive housing. Aisha Academy rapid re-housing services will help homeless youth (TAY) with low-to-moderate housing barriers to be quickly re-housed and stabilized in permanent housing, we will offer money management; life skills; job readiness skills; substance abuse treatment; and group therapy. Rapid re-housing is the most effective and efficient intervention for more than 50% of homeless individuals. Kareemah Homes is offering Residential Services to parolees (TAY) population 16-25 years old for short and long term stay, providing residents with a supportive environment, a clear and sober living experience and an alternate lifestyle. 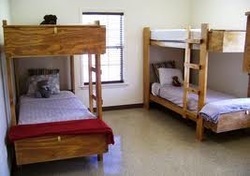 Will offer Transitional housing for parolees and Sober Living housing for the A'isha Academy. For the Men we will offer 1) Alcohol and Drug Treatment, 2) Anger Management Workshops, Criminal Thinking workshops, Insight seminars and Gang Anonymous Treatment programs. For the Women we will offer Grief & Trauma, Battery and it's effects (for the Batter-Women Syndrome) Anger Management, Alcohol and Drug Treatment and Critical Thinking.